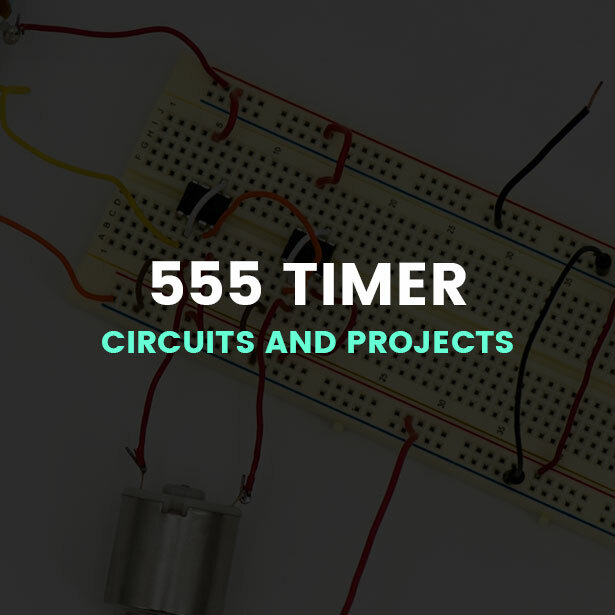 We are listing a curated collection of 555 Timer Circuits and Projects published in our site before. We have a large collection of simple and advanced projects using 555 Timer IC. In this article, we have handpicked some really useful 555 timer circuits which will be interesting to electronics engineering students and hobbyists alike. While selecting from the big collection, we have also taken care to add some 555 timer projects which fall in the fun & game circuits category, say like a Ding Dong sound generator. If you are a beginner in electronics, you should learn the basics about a 555 Timer IC, before you attempt to build 555 timer circuit or a full 555 timer project. We have published complete tutorial on 555 Timer – which covers the theory, working principle, internal diagrams and almost all information related to 555 Timer. Once you finish the basics, learn some really basic 555 timer circuits like a Monostable Circuit, an Astable multivibrator and a 555 Timer based Oscillator circuit. The tutorials listed above will help any beginner to learn the basics about a Timer IC very well. Anyone who completes those tutorials will learn how a 555 timer IC works, what is a duty cycle, how to change time constants, how to build a basic 555 timer circuit etc. Now let’s begin to build more interesting and useful applications using 555 IC. We have classified this curated list into two sections – the first one – 555 Timer Circuits – lists all simple and basic circuits using 555 Timer IC, which will help a student/hobbyist understand the concepts and fundamentals better.Â The second section – 555 Timer Projects – lists more advanced and real world type projects which helps a student to apply his/her knowledge gained while implementing all those simple circuits using 555 IC. As discussed, let’s begin our first section – 555 timer circuits – which lists practical and simple 555 timer circuits which helps a student to learn fundamentals about building a 555 IC based circuit. This timer circuit is wired as an astable multivibrator to display a seven segment counter with the help of the counter IC CD 4033. This circuit is mostly added on to other circuits so as to make it more attractive by displaying a counter. The timer circuit is used to trigger the counter IC, which in turn advances each count on the seven segment LED display LT543. The complete details about the circuit and its circuit diagram are given in the original article. A 555 LED Flasher circuit uses an astable multivibrator which produces pulses for flashing the lamp. Two resistors are set in the circuit to control the flashing rate. A half-wave rectifier, a transistor, and a TRIAC is used to drive the load. The circuit shown in the original post had some mistakes and the modified circuit is also shown right below the original post. Also take a look at the special notes as you are testing the circuit in live, and may cause potential shock hazards. This circuit uses a relay and a sensor to sense and switch when the light intensity crosses a certain limit. A Light Dependent Resistor is used as the sensor. The timer is connected to two transistors to drive the relay. Take a look at the complete working of the circuit in the original link given above. Also read the special notes given in the article to ensure that the procedures followed to make the circuit work are done correctly. We recommend 3 books on the basics of 555 timer IC, that can be bought online from our store. These books are from the author Forrest M Mims, whose electronics based books have sold more than a million copies, and are being followed in many renowned universities all over the world. Check out their reviews and buy them from our online store:-Â 3 Great Books to Learn 555 Timer Circuits and Projects. This circuit has applications as a proximity detector or liquid level detector. It operates by detecting the distance from the target by reflection of an infra-red beam. The timer output is designed for a duty cycle of 0.8 milliseconds, with a frequency of 120 Hertz and 300 milliampere peak current. Such a timer drives the infrared LED. An LM 358 IC is also used in the circuit as a comparator so that it receives the signal from one diode, as soon as it gets the infrared signal from another diode, and passes it on to the inverting input of the IC. The detailed idea of the circuit can be obtained from the main article. This circuit is used to switch on and off an electrical appliance using a TV remote. The signals are sensed using a sensor IC called TSOP 1738. The IC output will be high when it is not disturbed by any signal. Â This makes the transistor in the OFF state. If a signal with a frequency of about 38 Kilohertz falls on the IC, its output becomes low. This causes the transistor to conduct and thus sends a negative pulse to the timer IC, designed to act as a monostable multivibrator. Take a look at the circuit diagram and the detailed working on the main article. The circuit is used to produce an alarm as soon as an intruder passes nearby the circuit. It can be setup on your home premises for safety reasons. The circuit uses a LDR to sense the change in light due to the reflection of the intruder. This output is given to an op-amp comparator circuit. An astable multivibrator circuit is designed with the help of a timer IC and an infrared diode is used to produce infrared beams which are sensed by a phototransistor as soon as it is cut due to the motion of an intruder. This circuit is used to produce an alarm as soon as rain starts to pour in. The main components of the circuit are two transistors and a timer IC. A sensor is used to sense the fall of rain water and its output is given to a switch and thus to two transistors. This circuit is used to find a missing pulse or abnormally long period between two consecutive pulses in a train of pulses. Such circuits can be used to detect the intermittent firing of the spark plug of an automobile or to monitor the heart beat of a sick patient. As the first section is over, let’s move on to build more interesting 555 timer projects – which include advanced and simple 555 timer projects. A student/hobbyist can apply the acquired knowledge building the projects given in this section. This circuit can be used to escape from the disturbance caused due to mobile phone rings when you are at home. All you have to do is place the circuit near your mobile phone, and it will give you a visual indication even if the ringer is deactivated. Two 555 timer ICâ€™s are combined to produce a musical horn. The output of the first IC is connected to the discharge pin of the second IC. Both of them are connected to work as astable multivibrators. This circuit is used to make an alarm to wake you after ten minutes. Here, the circuit uses an LED instead of a buzzer. The circuit can be modified in your own way. The circuit consists of only a timer circuit designed as a monostable multivibrator. This circuit helps you to reduce and increase the brightness of low power incandescent lamps. The timer IC is designed as an astable multivibrator with variable duty cycle. A transistor is also used whose input will be driven by the timer circuit. The output of the transistor drives the lamp. The duty cycle of the multivibrator can be changed with the help of a potentiometer. A 555 LED Flasher circuit is used to produce a rotating effect when the LEDs are arranged properly. The circuit has very low current consumption and can be operated from even 3V button cells. An astable multivibrator circuit is set with the help of the timer IC with a duty cycle of 50% and 4Hz frequency. Another timer IC is also used to work as a trigger pulse inverter. The cicuit consists of two SE 555 timers that is toggled between two frequencies to produce a ding-dong sound. The first one is connected to the second in such a way that the frequency of the second NE555 IC is modulated by the output from the first IC. Water Level Indicator using IC 555 timer is one of the good projects.